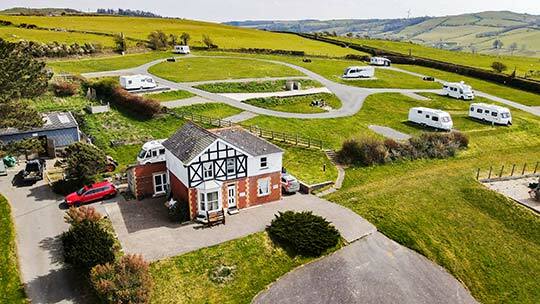 The 75 pitches for touring caravans, tents and motorhomes, all have panoramic views, and 60 electric hook-ups. 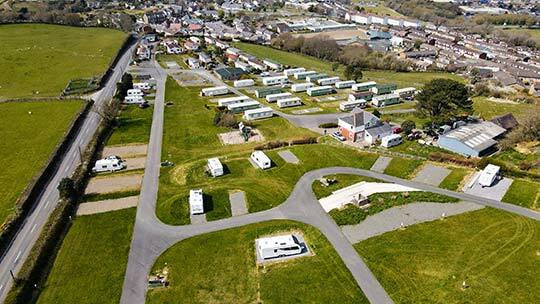 Although we do not have hard standing pitches, but many of our pitches are level and all are well drained, and easy to get on and off having direct access from a tarmac site road. MOTOR HOME DRIVEOVER WATER DISPOSAL POINT together with a new chemical disposal point. Clubs and bars can be noisy, we do not have either, but you have a vast selection available in Aberystwyth, and although we do not have a shop, the site is very conveniently situated for the out of town shopping precinct together with a selection of village shops nearby [within 300m]. We have a spacious amenity block with easy access from the touring sites, which has showers, toilets, washbasins and a separate washroom for clothes and dishes. TOKEN OPERATED WASHING MACHINE AND DRYER. We have a large climbing frame which proves very popular with the children. There is a bus stop into the town and the country approximately 250 yards away from park entrance near the A.487/A.4120 junction, by St. Anne's Church and opposite. Times of buses can be found ON GOOGLE by going on MAPS. There is a modern Sports Centre and swimming pool situated just a mile from our park. This caters for a large number of sports and also has a separate pool especially for small children. Late arrivals and departure welcome by prior arrangement please. IF YOU HAVE ANY QUESTIONS, please phone 01970 612542, or complete the "CONTACT US" form above. We will be happy to take bookings over the phone or by email prior to receipt of a completed booking form. PLEASE NOTE that no payment is required when you return a booking form, but payment in full is required at least 14 days before the date of your arrival. We provide a separate dog walk, but we do ask that owners pick up after their dogs and that they keep them on leads at all times. We have a small paddock for dog walking. See OUT AND ABOUT page.